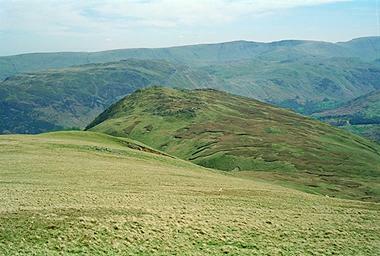 Care needs to be taken when descending this grassy ridge to the narrow band between the crags of Glencoyne Head on the left and Greenside mine on the right - it is just visible here. This latter is particularly dangerous as the grass at the top is undercut, like a cornice. This route is not recommended in mist. There are many faint paths up Sheffield Pike from Nick Head but they all converge on the summit. Larger version of this picture.